Oh, if only I could say and know that I would never move again. Ever. Moving on one's own is a BIG job, though I did have the help of a friend for a few days in the end. I think it will take me a few weeks to get over it. I have a storage unit where most of my things are, but also have my van packed with things (that I will give my family) and food and cleaning stuff that I am not sure where they will end up. It was a stressful time, and my whole body ached. So many things I have given or thrown away - and I still have some to get rid of - but it was a huge exercise, and I do need to check things. I also had some fun with my Shredder - it must be nearly 20 years old, and it worked well - for a while - before it died. I still had papers to destroy, so I rushed off to Officeworks to buy a Rexel. I'd done my research and liked the idea of this moderately priced beast - that does up to 50 pages at a time!!! The Shredder aisle was easy to find, and my chosen machine was on display. When I went to purchase one though I learned that they had none - just the display one and that I could find one at another store, but it was going to be a long trek to pick it up. So I asked to buy the display model. They don't normally sell the display model - but I convinced them to let me have it. Whoo Hoo. It was very easy to set up and impressed me immediately. It shreds the paper into smaller pieces than the old beast, and the collection box is much easier to empty/manage. 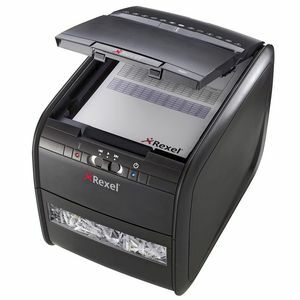 Image of Rexel Shredder from Officeworks Website. It did its deed, and I filled almost two bags of paper bits. I left them at a friend's place. She'll wonder where they came from, as the last delivery to her for her worm farm was different cuts of paper. One day I will find time to tell her!